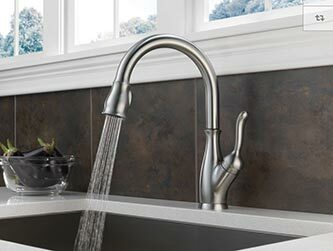 Anyone that has ever worked with The Hall Design Group knows that the Delta Brizo series of kitchen faucets has long been a favorite of ours, not only for the various styles offered but also for the ever-important pull down magnetic docking. The magnetic docking keeps the pull down in place when not in use, making it extremely practical in the kitchen. It amazes me that after 33 years in business I still see new and exciting things. Delta is now offering 2 new items in their line. The first and revolutionary item is the new “shield” technology. 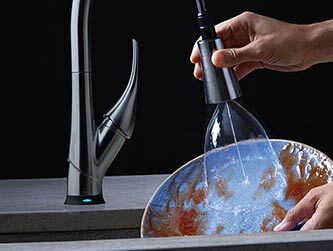 Delta Technology delivers a simple yet practical means to clean with laser-like precision while containing mess and splatter. 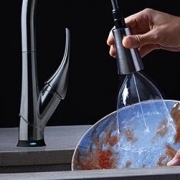 A concentrated jet of water powers stubborn messes away as an innovative water shield simultaneously contains splatter and clears off the mess. Also new into the line is the “Arctic” stainless finish. This new finish gives me another tool to add to my design arsenal when fulfilling The Hall Design Groups clients’ needs.